Re-tracing your steps to Anaxos, you can continue southwards to Skoutaros, Filia, Anemotia and Skalochori, all traditional mountainous villages. Further on you will come to Vatoussa a calming traditional village with a Folk Art Museum. To the south of Vatoussa you will come across the villages of Revma, Pterounta and Chidira, while if you continue west you will come to the Monastery Perivolis. 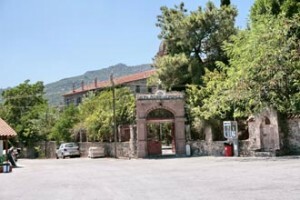 During the Byzantine times it was a Convent dedicated to the Virgin Mary. It was rebuild in 1630. Worthy of note are the icons of the fretwork icon-screen and the hagiographies painted during the 16th century. At a short distance from the monastery you will come to Antissa. The present day town was build near the site of ancient Antissa, the first Aeolian settlement in the island, with its ruins still visible. While there you can visit its Cultural Centre. To the north of the town there are two coastal areas worthy of a stopover : Gavathas and Lapsarna. To the west the road that leads you out of the town forks into two directions: the eastern to Sigri and the southern to Eressos. Following the eastern route you will reach the Monastery of Ipsilou, built on the rocky top of Mt. Ordymnos which is dedicated to Agios Ioannis Theologos. The choice of it location denotes its medieval origin (800 AD). A few more kilometres to the west, you will come to the Petrified Forest– a unique natural phenomenon, which was created by a volcano eruption some 15-20 million years ago. 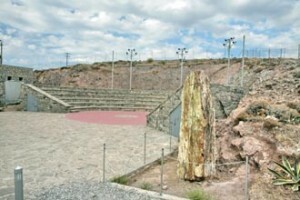 The road ends at the coastal village of Sigri, where you can visit the The Museum of Natural History-Petrified Forest, which also aims at the study, preservation and protection of the forest. At the western edge of Sigri there is a small castle build by the Ottomans. 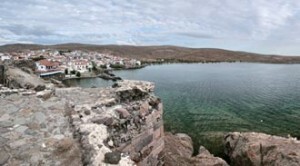 Exactly opposite of Sigri is the islet of Nissiopi where one can see petrified tree trunks under water. Additionally Sigri is a commercial port linking the western part of theb island to the port of Rafina (near Athens) once or twice weekly. Returning to the junction leading to Eressos, you will be travelling downhill through an equally rocky landscape before you reach the interesting, medieval Monastery Pythariou dedicated to The Archangels. It has a plethora of interesting icons, ecclesiastical objects and hagiographies. 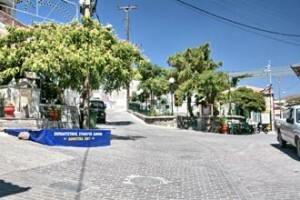 Leaving the monastery and returning to the main road you arrive at Eressos a small town with ancient roots. Here the Lyric Poetess Sappho (the 10th Muse) and Theophrastus were born. Three kilometres to the south, you will find Skala Eressou, another well known coastal resort with its sheltered sandy beach. The ruins of the ancient town were discovered, at the site of Xokastro, northeastern of Skala Eressou, The findings include walls, the theatre, the prytaneum, the agora and the ancient temples. At the site of Vigla, there are the ruins of medieval and Turkish small towers and an early Christian church (5th AD Century). 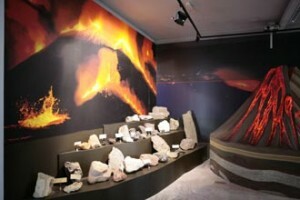 You can see the findings of the excavations at the Archaelogical Museum. 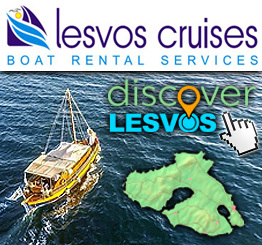 To the east of Skala Eressou you can visit the picturesque village of Mesotopos, and from there reach the beach at the hamlet of Tavari. Returning to the main road, you will be heading inland to Agra, another small village with traditional customs. Leaving Agra you are going downhill again towards the coast of the Bay of Kalloni and you will reach the beaches of Makara and Apothika. The ruins of ancient buildings in this area prove the existence of ancient settlements. Travelling now coastally along the Bay of Kalloni, the landscape changes to a verdant plain. Build on the green slopes of a hill, you will find Parakila and its Skala, where you can swim in the warm waters of the bay of Kalloni and enjoy traditional hospitality. Continuing your journey north eat you will reach Kalloni, the beginning of this travelogue.